"Mom and Pop were just a couple of kids when they got married. He was eighteen, she was sixteen, and I was three." There was no easy way for me to grow up, it was a struggle, only we called it life. Called it New York, 1920. Called it do what you have to. I didn’t have the legs for dancing and it wasn’t the voice they thought they wanted, but that $2 a night set me straight for awhile. Got me up off my knees, wrung that dirty water out from my skirts. I started using my throat to keep the roof up and did it different than my mama taught. They say my jazz is colored in blue. I learned it singing along in a brothel where the blues goes to remember itself. “I always wanted to sing like Louis Armstrong played, always wanted to sing like an instrument.” I’m an imperfect brass trying to sing the lonely hearts full of company. “There&apos;s no damn business like show business. You have to smile to keep from throwing up.” In Detroit “I had to be darkened so the show could go on.” In the South, they wanted me to smile and soft shoe quiet, take the other elevators where no one could see me rise. I don’t have to tell you this. Don’t need to explain like the world’s not run by people who don’t want me. "I have to change a tune to my own way of doing it. That&apos;s all I know." The song is what I have, I’ve worked to keep it every day I stay breathing. I work to stay breathing. Tiny clubs to Carnegie, jails cells and whore houses, up with Louis on that big screen. I go where it takes me. I know where the low lives. Fell in love and married it more times than I care to say. The blue comes easy, never had to look hard to find it. I gotta trick the light sometimes, deck myself in flowers and work every day to keep ahead of it. Find the people that breathe like me and hold that note together. My scales are all step-ladders and I’ve never been polished right, but I know what the song’s trying to tell you. I got pages of life to explain it. Singing it sure is easier than telling you the truth. You want my stories to visit you at night, haunt your shadows the way they done mine? You gotta have a life that gives you reason to sing. Fill yourself with it. Blow until you can’t remember which day the rent is due or what that man did to you or how you’re gonna wake up and do it all again tomorrow. You work for the moment until it’s not work anymore and you chase that high as far as it takes you. Just like love, it’ll mistreat you, get you all twisted up in it, make you think you gotta choice ‘bout what you’re gonna do. You think you can leave it behind, but then it’s all you know. Music’s everywhere you go, can’t hear a song without trying to twist it. You hear that train horn and wonder ‘bout the key. All the drugs in the world can’t get you high like that, can’t twist you up inside, no matter how strong that man and what he brings to your veins, the music is stronger, pulls you back. Makes you test it sometimes, see how deep those shadows go, make you think the body can’t forget to breathe. Can’t tell you how many times I gotta remind myself in a day to keep my lungs full, just to keep from drowning in it. All the men, people telling me no, locking me up, keeping me checked like a coat at the door, but I can’t stop as long as I have this breath to keep me above it. I stay above it, keep my roof up just to keep from drowning in the blue of it, sing my lonely heart full just to keep breathing, keep breathing ‘til it stops feeling like work, ‘til all the feelings out, until there’s nothing left to drown in. 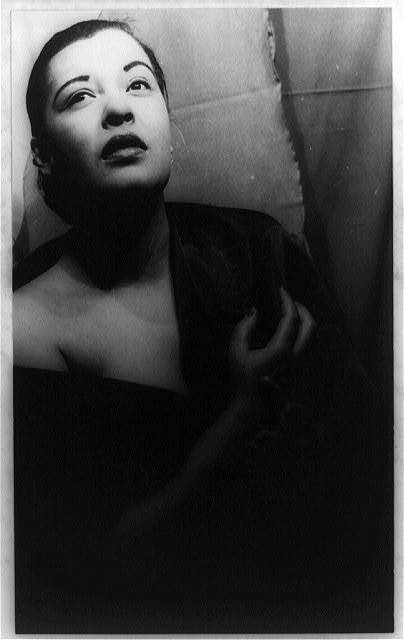 Correction: The audio for this post incorrectly states the location of Billie Holiday&apos;s death. She died at Metropolitan Hospital.